. 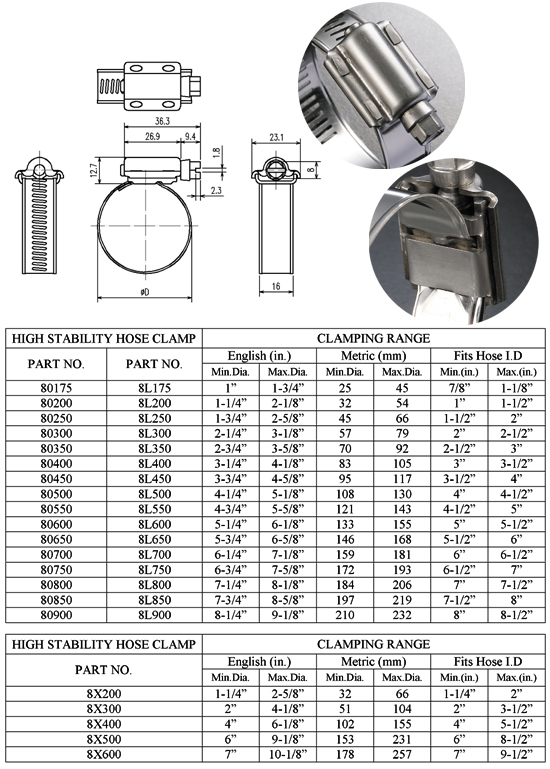 High stability hose clamp： there are three categories here they are: SY-80, 8L, 8X series. SY-80 series – normal hand through band design. SY-8L series – extended inner lining added onto the inner fringe of band..which prevents soft hose got extruded or even cut off by band slot.
. This protect the soft hose and avoid position-shifting of inner lining when in assembly. SY-8X series – is super lager range band hole number, allowing larger range of usage .., 5 sorts of size hose clamp can cover up to hose clamp dia. From 1 - 1/4" ~ 10 - 1/8"..this sure can help custom cut back their storage pressure. Material spec. Above three types of series band: width is 15.8 mm, thickness is 0.7 mm, #300 grade S.S.